In the game of hockey, one of the most difficult obstacles to overcome is a red-hot goaltender. Cornell netminder Andy Iles totaled a 1.55 goals against average over his previous nine games, registering a .946 save percentage during that tenure. Yesterday night in Game 1, Iles stole the spotlight, stopping 33 of 35 shots en route to a 3-2 Big Red victory. The last thing expected was a 10-goal blowout. 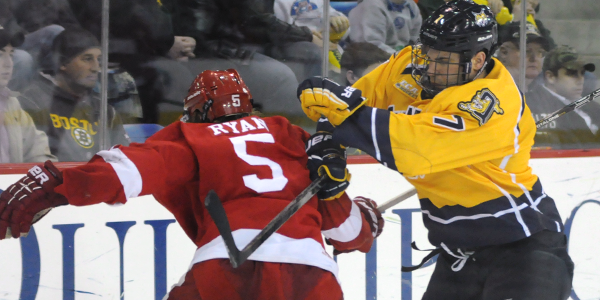 An offensive display unlike anything Quinnipiac had seen this season. A game where Iles would start, be pulled in the second period, and then reinstated for the beginning of the third. For the Bobcats, however, it was exactly what fell into their laps. Quinnipiac trounced Cornell, 10-0, Saturday night at High Point Solutions Arena at the TD Bank Sports Center, forcing a Game 3 in the ECAC Tournament quarterfinals tomorrow night at 7:30 p.m. Connor Jones, Ben Arnt, Travis St. Denis and Kellen Jones each notched four points to their credit, while the latter two recorded two goals apiece. Quinnipiac scored seven goals in the second period, an ECAC record. By the end of the second, the Bobcats were up 9-0, and Cornell had taken only seven shots on net. The Big Red, who totaled 20 shots in Game 1, didn’t get their first shot on goal until 12:24 of the first, only recording an additional two before the end of the period. Cornell finished with just 17 shots on goal, its second lowest game-total of the season. Three Big Red and Bobcat players were handed game misconducts, while 34 penalties for 184 minutes were assessed. It is unclear whether any of the infractions will result in suspensions for Game 3. At the end of the second period, a brawl ensued by the Cornell bench, resulting in nine players garnering 10-minute misconducts and two-minute penalties. Quinnipiac’s Bryce Van Brabant was suspended by the league before the game for an incident in Game 1 of the series. Iles made 26 saves on 32 shots, tying a season-high with six goals against. His replacement, Omar Kanji, allowed four goals on 10 shots. Quinnipiac lit the lamp right off the opening faceoff, continuing their trend of getting on the board first. Matthew Peca corralled the puck behind the Cornell net, sending a perfect feed to Connor Jones on the doorstep. Jones then wristed the puck through Andy Iles’ five hole, giving the Bobcats a one-goal lead just 24 seconds into play. Then, in the eighth minute of the first period, Quinnipiac extended its lead to two off a Currie blast from the top of the far side circle. Currie drove a shot on net, while St. Denis screened Iles. St. Denis then redirected Currie’s bomb past Iles, tallying his seventh goal of the year, a team-high among freshman. Early in the second period, Quinnipiac pushed its lead to three of St. Denis’ second of the evening. Arnt wrapped around the Big Red, later connecting with St. Denis in the slot. The forward then one-timed the puck, beating Iles at 2:21. The second period offensive assault did not end there, however. At 5:36, Peca collected the puck on the near-side boards, dangled, and went top shelf on the glove side. Fifty-one seconds later, Cory Hibbeler buried a loose rebound past Iles’ left pad for the five-goal advantage. After Iles was replaced between the posts for Kanji, Quinnipiac added four more goals in a span of just 7:24. Arnt notched his seventh of the year, while Kellen Jones followed with a deke in the slot. Jordan Samuels-Thomas then added a snipe from the hash marks off Kanji and in, and Kellen Jones closed the period with a wrist shot from the far side point. In the third period, Dan Federico connected with Zach Tolkinen on a one-timer goal from the point, good for the junior’s second of year.